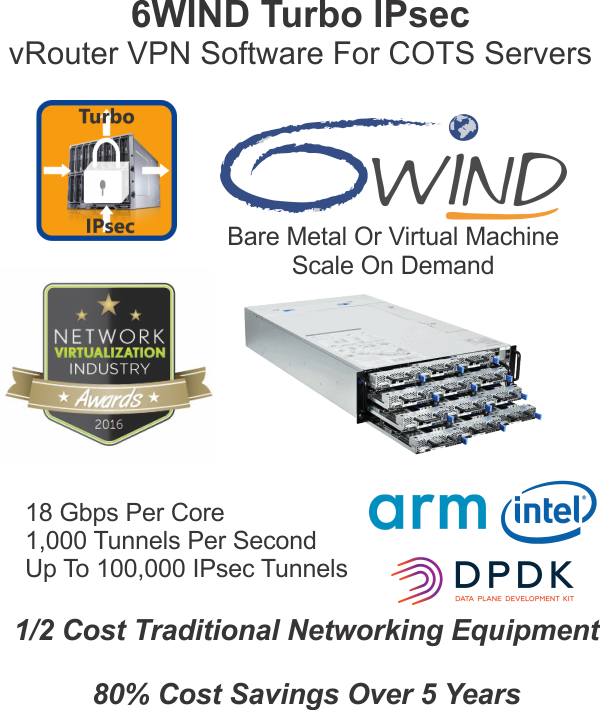 6WIND Turbo IPsec™ is a high-performance, ready-to-use vRouter software network appliance, to be deployed in bare metal environments or as a virtual machine. With 18 Gbps per core of security performance, 6WIND Turbo IPsec provides the performance of hardware networking equipment with the ease of deployment and flexibility of software. 6WIND Turbo IPsec delivers industry-leading IPsec price/performance ratios when comparing one 2 rack unit (RU) x86 server to a competing 2RU hardware appliance. This comparison also applies to two 4RU x86 servers versus a competing 16RU system. In both cases, 6WIND Turbo IPsec on x86 servers has over 50% less cost per Gbps of encrypted IPsec traffic. Complete set of features including IPsec VPN, L2, encapsulations, IPv4 and IPv6 routing, virtual routing, firewall, NAT, QoS, High Availability and more. 6WIND offers traditional CLI and IT style management based on YANG data models.